I’ll admit it, I am a self-proclaimed “snacker”. I know it’s not technically a word, but I think you know what I mean. Perhaps you’re a snacker too? Three meals a day just won’t suffice and you find yourself raiding your fridge and cupboards throughout the day, or stopping off at the nearest coffee shop for a little treat. If you’re eating healthy snacks, that’s A-OK, but snacking on high sugar, high calorie munchies is a recipe for disaster. In order to make sure you’re filling yourself with healthy snacks, it’s best to make or pack your own when you’re on-the-go. Relying on a muffin from Starbucks or a pack of chips from the convenience store ensures your calorie intake is high and your energy is low. Sweets may be a quick fix, but they won’t keep you satisfied and are sure to contribute to unwanted pounds. You want to make sure your snacks are high in protein and fiber so you won’t be craving food all day. To get yourself through the afternoon slump and keep yourself satisfied between breakfast and lunch, and lunch and dinner, there are a number of healthy snacks to have on your radar. Not only are they high in protein, fiber and vitamins, but they are truly tasty. You’ll enjoy munching on them throughout the day, and with under 100 calories each, they’ll keep the weight off. From apple slices with peanut butter, to edamame, nuts, and even popcorn, these 13 healthy snacks will keep you full and satisfied when food is all you can think about. Edamame is one of my favourite snacks – or appetizers when I’m out for sushi! They are so simple to make and snack on, plus ½ cup of edamame has over 8 g of protein and 4 g of fiber. They’re sure to keep you full and are easy to pack for a quick snack! I’ve completely converted to all-natural organic peanut butter. Anything else is PACKED with sugar, and you’re not really getting any of the awesome benefits peanut butter has to offer. Slice up your apple and measure ¾ of a cup, then spread on the peanut butter, using 2 teaspoons in total. Peanut butter is a great source of protein, plus, what could be better than mixing sweet and salty! I have to admit I’m not much of an egg person, but when I do eat them, it’s hard-boiled all the way. A hard-boiled egg is an ideal snack because it’s convenient to bring with you on-the-go, and there’s 6 grams of protein in only 78 calories. Make a batch and store them in the fridge to eat throughout the week. I love blueberries as much for their taste as their health benefits. They are one of the best sources of anti-oxidants and only have about 83 calories for a 1 cup serving. How great is that! If you’re someone who likes crunchy snacks, you can freeze your blueberries for an extra crunch. With ½ cup non-fat plain yogurt and a tablespoon of sunflower seeds you’ll get a good boost of protein with the yogurt, and the seeds only add 19 cals! Sunflower seeds are also a great source of vitamin E, B-1 and copper. Another great tip: Buy non-fat yogurt that has “live” or “active” cultures to get a good dose of probiotics. If you love yogurt, but you’re more of a sweets person than a seeds person, go for ½ cup of non-fat Greek yogurt and a teaspoon of honey drizzled over it. You may also love this option for an after dinner dessert. You’ll get tons of protein from the yogurt to help you feel satisfied, too! You can eat 14 almonds and stay under 100 calories. They’re perfect to take on the go or to snack on while you’re at your desk. Almonds are rich in protein and fiber, which means they’re great at staving off hunger. Any popcorn lover is bound to love the sound of this! Popcorn is high in fiber to help keep your hunger at bay, and it’s crunchy and tasty – does it get any better? It does! Some microwave popcorn brands have 100 calories in a whopping 6 cups. A navel orange has about 80 calories, is low in natural sugar and high in vitamins and fiber. They’re juicy and sweet, and their skin makes them super convenient to carry around on the daily. Plus, the fact that you have to peel and section them allows you to savour and eat them slowly. Another nut that’s high in protein, fiber, vitamins and minerals, eating 20 pistachios will keep you around the 80 calorie mark. They may have a high fat content, but not to worry, it’s “good” fat with plenty of benefits. They’re super tasty and fun to crack open, just make sure you have a garbage can near by! Another one of my go-to snacks, a ½ cup of oatmeal is sure to keep you satisfied throughout the afternoon. It’s rich in protein and fiber, plus it’s warm and delicious. Simply mix an instant pack of oatmeal with boiling water, or heat it up in the microwave and you’re good to go! For a low-calorie twist on bagel and lox, create a smoked salmon pin wheel with low-fat cream cheese. Spread 1 tablespoon of cream cheese on a piece of smoked salmon and you’ll get a helpful dose of protein and omega-3 fatty acids. Tangy and sweet, dried cranberries are the perfect mid-day snack. If you’re worried about the amount of sugar, you can opt for unsweetened varieties, but a ¼ cup of dried cranberries has just 93 calories. They’re perfect for popping in your mouth. Healthy snacks are easier to come by than you may think. Don’t fall into the trap of high-sugar, high-calorie snacking! Be aware of your snack foods and keep them healthy with this handy list. 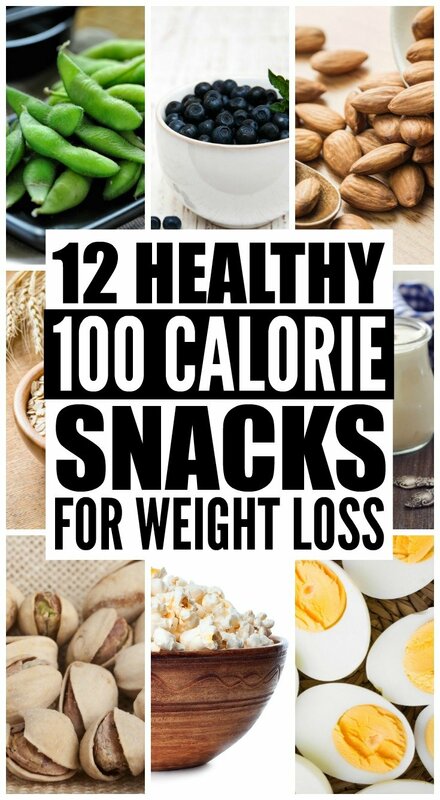 For more healthy snacks under 100 calories, check out the book Snack Recipes Under 100 Calories: Fat Burners Made Easy: 50 Snack Recipes That Burn Fat In Minutes by Ray Estevez. It’s filled with lots of great ideas to help with your weight loss efforts! If you found this list of healthy snacks under 100 calories helpful, please share it on Pinterest! And if you’re looking for more health-related tips and tricks, please follow our Health & Fitness board on Pinterest where we share all kinds of great ideas!